The Retiring List is Out!!! Happy Monday!!! 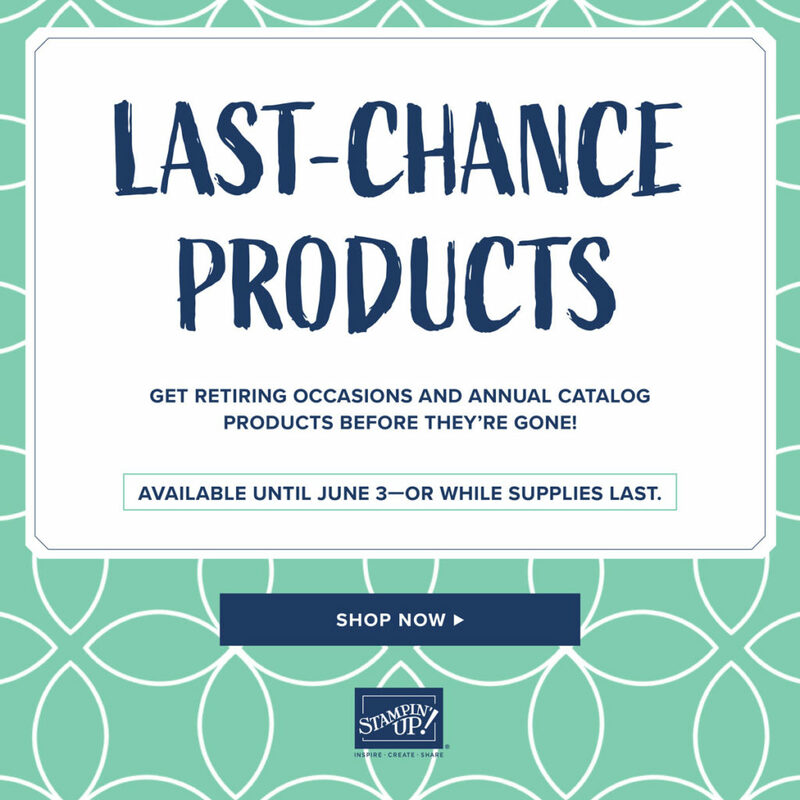 Let’s add some excitement to this Monday because the Stampin’ Up Retiring List is out!!! Each year in June, Stampin’ Up releases the new Annual Catalog. In order to make room for new stuff to keep current and fresh, they have to retire some products. Some of these may be your favorites and you are sad to see them go. Some of the products you might not even know it existed and now is your chance to snag some at a discount and others you might think…okay bye! Just remember that while we are sad to see some go, that just means more fabulous products are coming!!! These items are while supplies last so don’t delay in ordering that item you have been eyeing or stocking up on those items you love. Click here to start shopping!!! Remember that if you order is over $75, you will earn Laura’s Free Stamp Set of the Month which is the Vibrant Vases Stamp Set! While it is sad to see some things go, just know that means there are even more fabulous new products coming out!!! 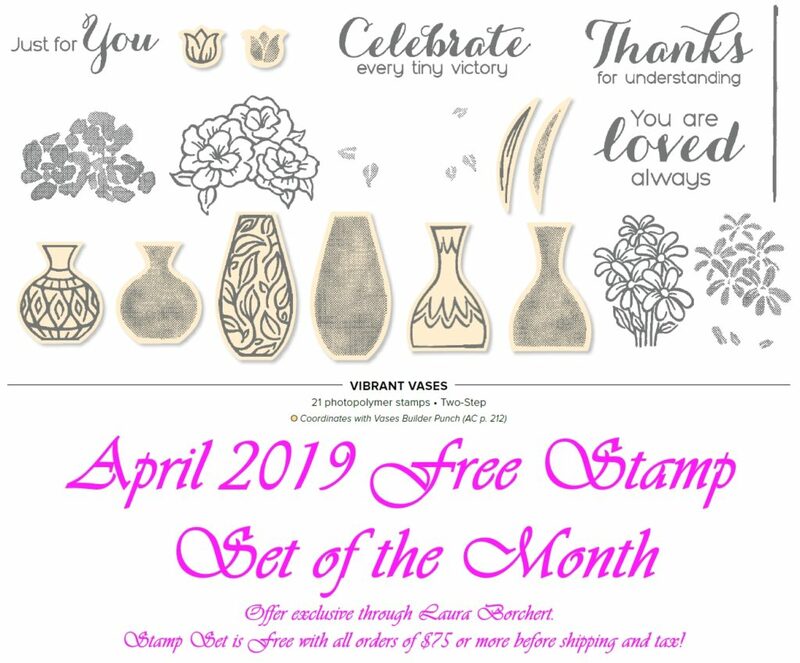 April 2019 Free Stamp Set of the Month!!! Happy Friday!!! It’s a new month so that means a new free stamp set!!! The April 2019 Free Stamp Set of the Month is…. You all know how much I love flowers and of course this set has them! The other fabulous thing about this set is that it coordinates with the Vase Builder Punch that I know so many of you love and have!!! The vases and flowers can be stamped alone or with the 2-step stamped image for a filled in color. If you notice in the images above, there is a solid image as well as a gray/shadow looking image. That gray image is the second stamp which can be used to stamp the same shade but perhaps stamped off once for a lighter look. It can also be stamped in a completely different color too! Coloring in the image with Stampin’ Blends, Watercolor Pencils, or Markers is another option too! I love it!!! This offer is exclusively through me for any orders during the month of $75 or more before shipping and tax. This could be 1 order or 3 orders totaling that amount! The stamp set will come separate from your order if ordered online. Click here to start shopping!!! Happy Friday!!! There is so much going on right now so I thought I would give a Sale-A-Bration Update!!! Sale-A-Bration ends on March 31 so we only have a few weeks left!!! While you may have heard that some items are no longer available, there have been more added as well! Click here to see all of the original Sale-A-Bration items still available, the 2nd Release Items, and the catalog product that you can earn!!! There are goodies at the $50 and $100 level!!! The items no longer available include the Parcel Post Card Kit, Grapefruit Grove/Lovely Lipstick Foil Paper, Ribbon Pack, and Butterfly Elements. There is also some fabulous Sale-A-Bration coordinating products available to purchase this month only (while supplies last). No more fussy cutting!!!! Woot Woot! Stampin’ Up has framelits for the Sale-A-Bration Stamps – Frogs (So Hoppy For You), Lilies (Lasting Lily), Cupcakes (Hello Cupcake), and Blended Seasons!!! UPDATE: The Frogs (Hop Around Framelits) are SOLD OUT!!! You can really make your project pop when the image is die cut out and layered onto your project!!! There is also a fabulous stamp set and a new punch. Click here to see all of these items! Don’t forget that when you purchase these items you are also earning more Sale-A-Bration goodies. YEAH!!! Get these before they are gone because they are going fast! Happy Friday!!! Happy March!!! Now there is even more to celebrate with the NEW Sale-A-Bration Coordination that starts TODAY!!! These items are available in March only and WHILE SUPPLIES LAST! That last part is super important because I think these items are hot hot hot and could go fast so don’t delay in getting your hands on them! Click here to start shopping! There are framelits for the Lasting Lily, So Hoppy For You (frogs), and Hello Cupcake Sale-A-Bration Stamp Sets from the originals. Then there are also framelits for the new Blended Seasons Stamp Set that came out a few weeks ago. No more fussy cutting! Woot Woot! But wait that’s not all….there is also a new Punch and Stamp Set too!!! Check it all out here! The best part about all of this fabulous new product is that you can still earn even more Sale-A-Bration freebies when ordering these products! Every $50 spent earns you a Free Sale-A-Bration item! If you order $75 or more, you will also earn Laura’s Free Stamp Set of the Month which is the Bloom By Bloom Stamp Set! Click here to start shopping and earning! Have a wonderful weekend! I’ll see you back here on Monday! Happy Stampin! Happy Friday!!! Do you have big plans this weekend?? 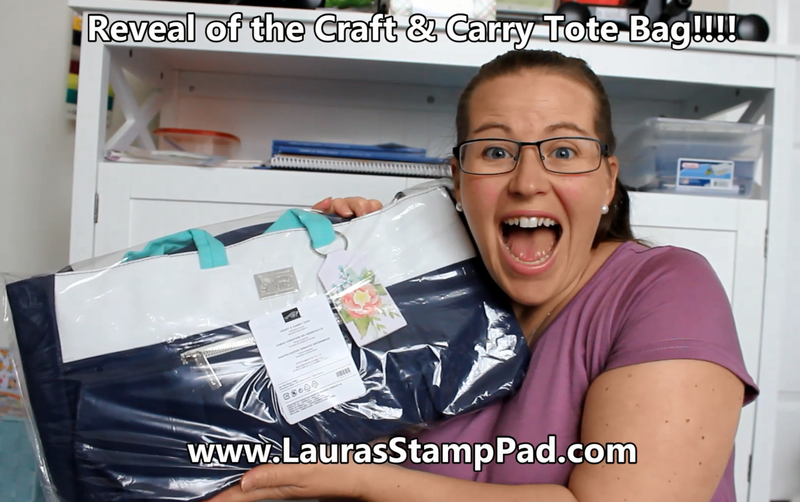 I hope you have an amazing one but first I wanted to give a little Laura’s Loyal Stampers Update!!! I created this program to reward all of you for being loyal to me! I want you to know that I appreciate you so very much. Laura’s Loyal Stampers Stickers are given for every $40 in orders. This means if you order $43 you will earn 1 Sticker and if you order $80 you will earn 2 Stickers. I keep track of your stickers for you and when you earn 10, you earn a $40 Gift Certificate from me!!! Each month I calculate the stickers and send out Gift Certificates. These above were from a few months ago because I tend to forget to take photos! 🙂 If you ever wonder how many stickers you have, feel free to reach out!!! 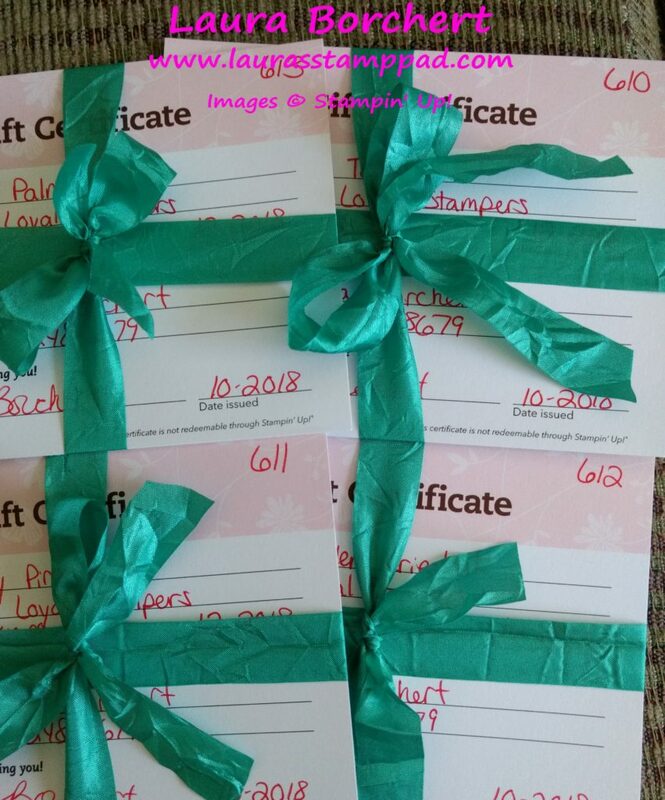 If you have a Gift Certificate, you can use it towards a class or an order! If you aren’t local, just email me your order, I’ll take the amount off and you can pay the overage if there is any! It’s that simple! Here’s to another fabulous year of Laura’s Loyal Stampers Stickers in action! Also, your stickers never expire so it doesn’t matter if it takes you 3 months or 3 years to earn your 10 stickers! Woot Woot! I hope you all have a wonderful weekend and if you want to start earning stickers, click here to start shopping! Happy Friday everyone! Who’s ready for the weekend??? My hand is up for sure! I love weekends relaxing a home with Brad and little Claire! She’s always doing something new and it’s so exciting to see. Plus baby snuggles are the best! Before we start the weekend though, I wanted to share a little Fun on Friday….after all it is Sale-A-Bration time!! 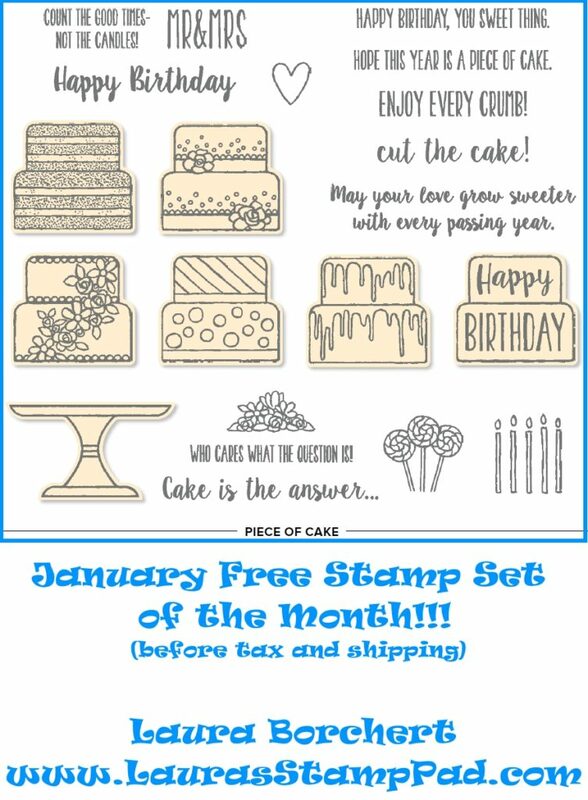 Don’t forget that the Free Stamp Set of the Month is the NEW Piece of Cake Stamp Set! Any orders of $75 or more in the month of January will earn this set. I also wanted to point out that if you order multiple times and it totals $75 by month end, that still counts! Of course with Sale-A-Bration, you will earn a Free item at $50 and $100 so there is free stuff all over the place! Click here to start earning! With Sale-A-Bration, there are so many ways to earn goodies. As a customer, you can earn free product at every $50 spent. As a hostess, you can earn an additional $25 in Free Product when the party/order totals $250 or more. That is on top of the hostess goodies you already are earning. This can be a single order or gather some friends and combine the orders. I also do private classes where you and your friends gather for some fun stamping! Are you loving everything in the Occasions Mini Catalog and want to enjoy Sale-A-Bration to the fullest???? Join Stampin’ Up! and my Fabulous Friends Family now and get it all! When you join during Sale-A-Bration, you get to pick out $175 in any product you would like for just $99 plus tax. The shipping is free so there is a 10% savings already! Also, this year, you can add on this amazing Craft & Carry Tote to your kit and pay just $129!!! Woot Woot! I have to say this bag is amazing! I may be a bit of a bag lady but I would join again just for this bag. Click here to join in the fun with me and my stamping girls! Have some questions you would like answered first? Of course I would love to answer any and all of them so just reach out! January 2019 Free Stamp Set of the Month!!! It’s Friday!!!! The Occasions Mini Catalog and Sale-A-Bration have begun!!! Now let’s hear a drum roll for the January 2019 Free Stamp Set of the Month……. I have been having a lot of fun with the Piece of Cake Stamp Set because cake goes perfect for any occasion even to celebrate Friday. I love love love the greeting that says Cake is the Answer….Who cares what the question is! Come on now, isn’t that amazing???? There is a coordinating punch to this stamp set so if you don’t like to fussy cut images out, be sure to add that to your order!!! If you order totals $75 before tax and shipping, you will earn this set for FREE!!!! This offer is exclusive through me – Laura Borchert. You can earn this with online orders or in person at an event or emailing me your order! Click here to start shopping! My Girls Night Out Stamp Event is this coming Thursday, January 10th at 10 a.m. and 6:30 p.m. 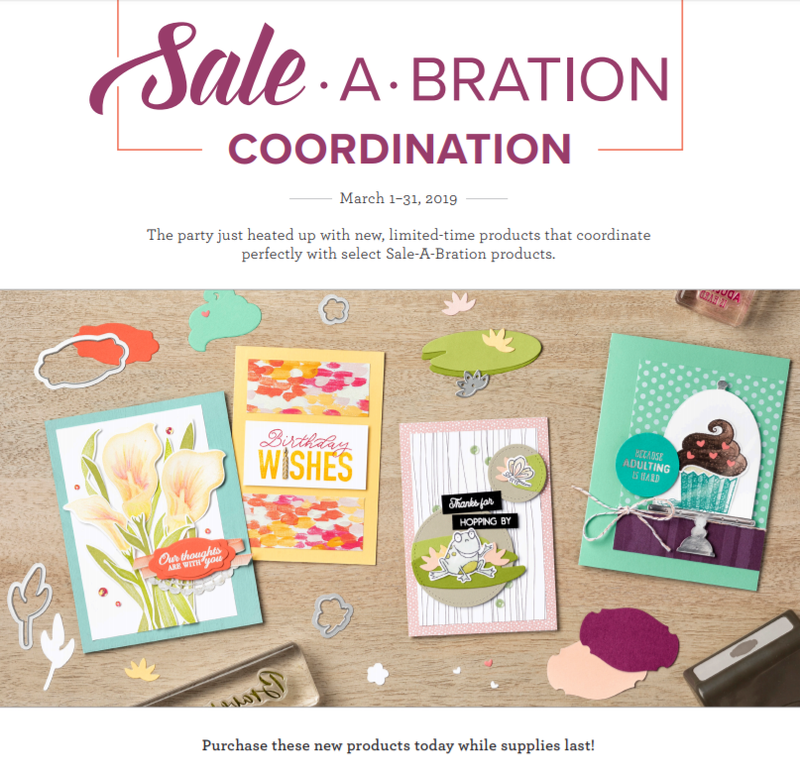 If you live local or want to drive, come on over to see lots of new product and samples from the Occasions Mini Catalog & Sale-A-Bration! Click here to RSVP! Happy Friday!!! Are you ready for the weekend?? We have a full weekend of family time and ready or not it is coming. I’m making chocolate chip cookies today and everything else will be made the day of the event! Claire will get lots of family time….let’s hope it goes well. Sometimes she isn’t a big fan of loud noises and getting passed around. Before we close out the week, I thought I would share a few weekend reminders! Stampin’ Up’s Year-End Closeout is still going on. The Holiday Mini Catalog ends of January 2nd so these items will be gone for good….except those on the Carry-Over List. Shop the sale items and retiring items here! 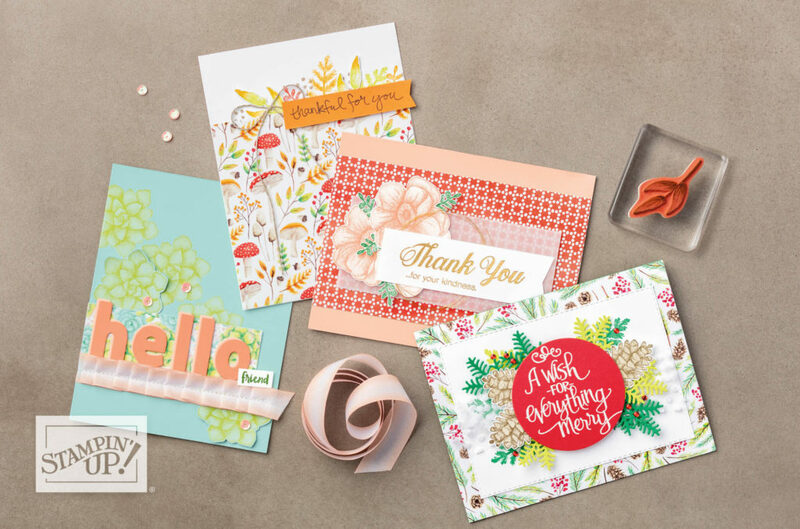 Some of the items that are on the Carry-Over List are the First Frost Stamps and Framelits, Sprig Punch, Epoxy Shapes, Tin Tile Embossing Folder, Buffalo Check Stamp Set, all the Stampin’ Blends colors from the Holiday Mini and many other goodies! 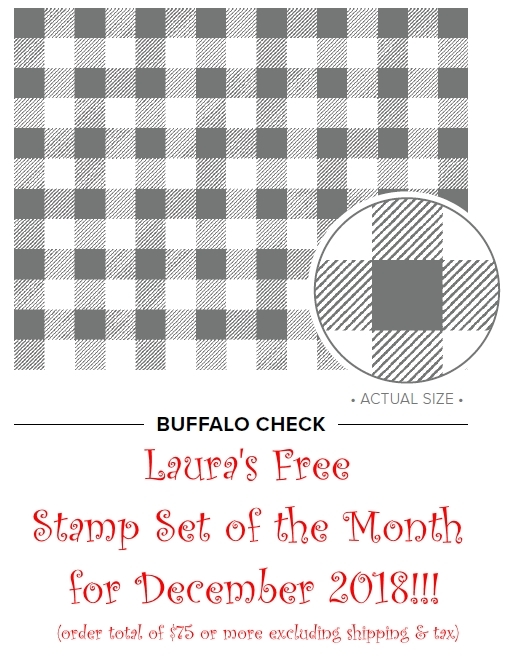 My Free Stamp Set of the Month for December is the Buffalo Check Stamp Set. All orders over $75 this month will earn this set for free! It will come from me and not with your order if you place it online. Trust me you are going to want this set and there is even more fabulous Buffalo Check goodies coming in the Occasions Mini Catalog! Want Santa to bring you Stampin’ Up goodies in 2019? Don’t forget that I offer Gift Certificates in any amount! Feel free to pass my information along to your friends and family to get you exactly what you want this year! December 2018 Free Stamp Set of the Month!!! Are you ready for it??? The December 2018 Free Stamp Set of the Month is……. I think I might be the last one to realize that Buffalo Check is HOT HOT HOT right now! I do know that there is a lot of Buffalo Check and Gingham coming in the Occasions Mini Catalog in January so I thought why not get the party started this month. The Buffalo Check Stamp Set is a background stamp that you can stamp in any color!!! You can earn this set for FREE all month long when you place an order of $75 or more (before shipping or tax) online or in person! This offer is exclusively through me. Click here to start shopping!!! I hope you all have a wonderful weekend! I have my last stamp class of the year tomorrow and while I’ll miss all my stampers, I am excited for a little break and family time for the Holidays. Of course, I’ll still be working to finish up some projects and prepare for January too! Happy Wednesday! Anyone else think this week is dragging on? I sure do….but then again on Monday I felt like it was Thursday already. Stampin’ Up is spicing up the week with some fun! The Year-End Closeout Sale starts today as well as the Craft & Carry Stamparatus Bag being available now!!! Woot Woot! These items are only available while supplies last or until January 2nd. Don’t wait long as some will sell out quickly. Click here to start shopping! 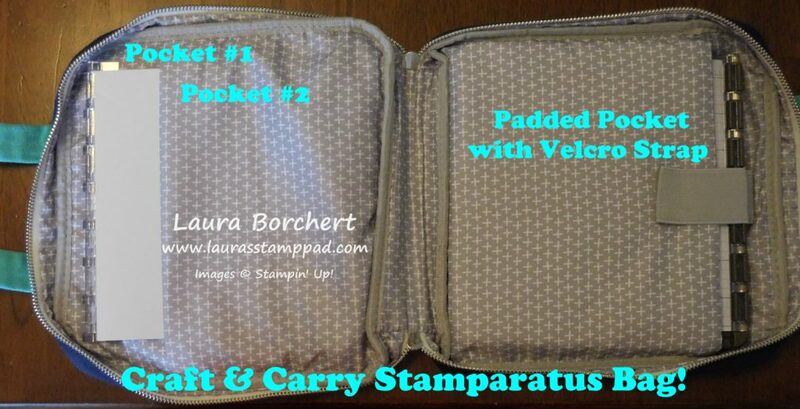 Click here to get the Craft & Carry Stamparatus Bag!!! I think this will be a HOT item so get yours today! Don’t forget that all orders of $75 or more before tax and shipping will earn Laura’s Free Stamp Set of the Month! This month it is the Buffalo Check Stamp Set! Woot Woot!